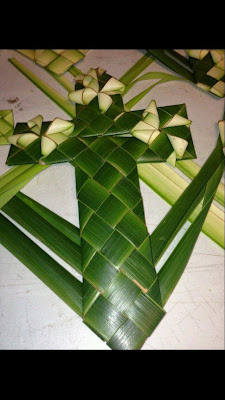 I pray all you lovelies are having a happy and blessed palm Sunday. 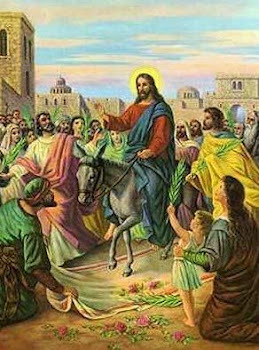 Palm Sunday was always interesting and a bit of a mystery to me as a child, my family didn't attend Church very much, so I wondered what the palm fronds were all about. My parents always answered with the usual, for Palm Sunday but with not much else. When I got to go to Church on some rare occasions and for about two weekends when I was very young, my father wanted to show me what a place of worship was about, it was not near Palm Sunday so I still had no clue but I liked the idea of it all. My father was a lapsed Catholic and my mother was a Protestant with a strong dislike and distrust for the religious establishment that she felt served man's ulterior motives more than God. When my father took me to an Italian Catholic church in our neighborhood, I was excited as we walked there, anticipating answers and some awesome stuff. Boy, was I disappointed. It was stuffy, sombre, devoid of the answers I had been longing for, and so eerily quiet until the priest spoke. I had never felt further from God or Jesus, and after two tries, my father realized it was a try that yielded no success. My mother was also firm that I had my children's Bible and story books about The Lord, that when I was old enough I would make my own way, and that was the end of that. I was too young to understand the fuss and just went about as per usual. I just knew that what I had been shown in that particular church was not the Church of God that I knew and felt close to. Wanna know something? I talked to Jesus and God all the time as a little girl, they always felt close. I would talk to them at night before falling asleep, in the day when I was playing and running in the fields, when the leaves on the trees would sway, when the petrichor would waft over to my little nose and it's comforting, sweet, fresh smell reminded me of Jesus, and when I was terrified about things I was too young to understand, there He was soothing me with the sounds of the rapids coming through my window and what felt like a gentle hand on me. 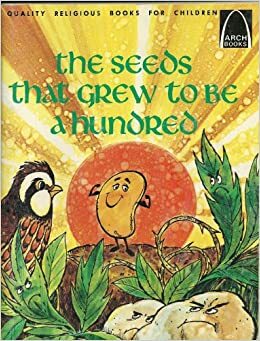 I adored reading my children's Bible with all the pictures and wonderful stories, Sampson always stuck out in my mind, and Daniel in the Lion's Den(which coincidentally was my sons most treasured story when he was very small), but by far my favorite story book was, The Seeds That Grew to be a Hundred. I loved that book, the binding had to be taped back together several times because I read it so much. It wasn't clear to me who Jesus was in the "religious" or historical context that others spoke of. For me, he was important because his words rang true, touched my heart and felt right, down in my soul. Jesus spoke of the Christian that was trampled down, choked by the weeds of life, or who's ears were closed so they could not hear his word, all in parable. Then He spoke of the Christian that every Christian aspires to be, the one who heard His words, who was not trampled down, who had not cast His teachings aside, who allowed the word of Christ to seep in, grow, and blossom, spreading out to the world. All I remember was wanting to be the good Christian who heard the words and lived them the way he spoke of in such a kind and loving way. I love Jesus, not just because He gave His life to pay for our sins but because even when he knew what had to be done, what His journey was going to be and the horrors of it's path, He still went on it. He did so with love in his heart, with a sight that saw beyond our fears, our cruelty, our foolishness, our hardened hearts, he loved us at our darkest and even asked that we be forgiven because we knew not what we were doing, in the total scheme of everything. I love Jesus even when I struggle with my faith, when I am frightened or overwhelmed, when I fall. He finds me, picks me up, dusts me off, accepts my apologies, and welcomes me back with open and loving arms. What a blessing to have such mercy and love. Jesus is my savior, not my religion and I am, as an adult what I consider a Christian, am I perfect? No, however, I still love reading about Jesus's life and ministry, the way He touched people, the example He set for us all. So, this week I will be posting daily, about the week leading up to the crucifixion of Christ and keeping the focus on what this Holy holiday is really supposed to be about. A week before Jesus was crucified, he was welcomed into Jerusalem and had a parade in his honor. When he arrived there was a large crowd of people lining the streets, waving palm branches and screaming "Hosanna!" However, seven days later when he was sentenced to be crucified, it was a different tune when there was another crowd present, quite possibly filled with many of the same people, and instead of yelling "Hosanna!" they were yelling "Crucify him!" 8 And many spread their garments in the way: and others cut down branches off the trees, and strawed them in the way. 9 And they that went before, and they that followed, cried, saying, Hosanna; Blessed is he that cometh in the name of the Lord: 10 Blessed be the kingdom of our father David, that cometh in the name of the Lord: Hosanna in the highest. 11 And Jesus entered into Jerusalem, and into the temple: and when he had looked round about upon all things, and now the eventide was come, he went out unto Bethany with the twelve. 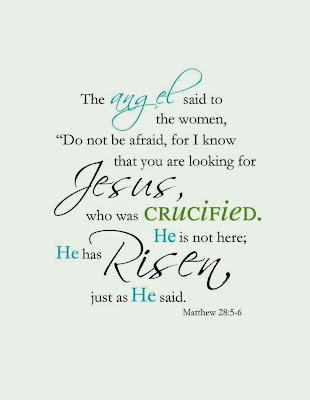 In all the chocolate, bunnies, family time, and feasting, please take some time to recall the real reason for this time of the year. May Jesus be in your heart and may God bless you in all your ways.